I love Sundays. We have church, come home to a family meal then just relax. We try not to do laundry, housework, etc. on Sundays. I usually take this day to re-group for the week and organize the week ahead. Today I plan on setting new goals in several areas of my life including my Body For Life Challenge. Over at Scrapwords we are talking about change the whole month of September. Challenges start Monday, September 1st. Please join us! Make September 2008 the start of something big!! Check out my Scrapwords logo. I've had my website for over a year now...time just flies! It's been lots of hard work but more fun and more gratifying than I imagined. I've made so many dear friends there and been inspired not only to scrap more but to live a more creative life everyday. We'd love to have you stop by and join our community!! 1) Michael Johns-I loved him from day one and thought for sure he'd make it to the Top3. After last night there is no doubt he should have. He came out on stage singing We Will Rock You by Queen...AWESOME! His voice...I will buy his album as soon as it hits the shelves. He not only is a talented singer but his interaction with us was right on. Several of the idols had ZERO personality last night (think Ramielle...she is a terrible singer btw and Kristy Lee Cook had zip when talking with the audience). 2) Carly Smithson-HOLY COW this girl can SING!! If I hadn't been a fan before I would have been after last night. She belted out Heart's Crazy on You and rocked the house. She is so pretty in person, too. 3) Brooke White-What a sweet heart! She opened with her piano playing the Beatles song she did on the show Let It Be. This was so cool for me as that is one of my favorite songs-EVER! She was super cute with all of us, too. She played fun, light, folksy songs after Let It Be. 4) Jason Castro-A disappointment. After last night I realized he never should have made it to the Top 4. I mean he had a few good songs on American Idol but actually hearing him live-not so good. His first song was the BEST!! he sang Over the Rainbow. After that the singing and the songs turned amateurish. Too bad. 5) David Archuletta-His voice is so PURE. This kid can sing the pants off anybody. What an amazing gift he has been given!! He is so sweet, down to earth and you just want to hug him!! :) My daughter adores him and about fainted when he came out. I was very disappointed though...he didn't sing John Lennon's Imagine. 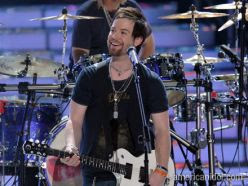 6) David Cook-One word STAR!!! I have been a David Cook fan since day one and it was obvious last night that when Paula, Randy and Simon heard him along with Dave Archuletta they knew they had two stars on their hands. David can sing, he plays the guitar, he puts on one amazing show, he interacts with the audience like a pro and he is humble. This guy is going to be the biggest selling idol EVER!!! That is just my opinion of course. You should have heard the crowd last night. First of all we were in his hometown. He's from Blue Springs which is Kansas City...so we met people last night who knew him personally and they all had these shirts made...it was fun seeing that! David came out in a Kansas Chiefs jersey singing his version of Lionel Ritchie's song Hello. Oh, man I love that song!! We all screamed so long and so loud. He finally cracked, just stood there looking at all of us and began crying. He was so overwhelmed with the reaction of his hometown. He is just so sweet *sigh*. All in all this was my favorite Idol concert to date. I've been to Season 3 and Season 5 concerts. Season 3 was the year of John Peter Lewis or fondly called JPL. We saw George Huff and Fantasia, too. Season 5 was Carrie Underwood and my favorite Bo Bice. With another Idol season over my family and I eagerly await for January when the new season begins. No doubt there will be another concert in our future! So just 1 month ago I had never heard of Edward Cullen. I had never "been" to Forks, Washington and I did not understand what all the hoopla was about regarding the "Twilight" series. But now, it seems, I am hopelessly hooked on not just Edward but the entire Cullen family, Bella and her dad Charlie and the thought of living in rain-soaked Forks is sounding more appealing all the time. *Sigh*. I am 100% addicted to Stephanie Meyers "Twilight" series. How and when did this happen? I bought "Twilight" (the first book in the series) for Emma last summer while in Utah. Every teenager we knew had read it and said it was the best. Emma ended up reading about a 1/4 of it then quit. I never gave it another thought. This past July while cleaning out my daughter's room I found the book in the floor of her closet. I decided to take it with me for something to read while on my flight to Chicago. Honestly I never even thought I'd finish it...just use it while in the air and give it back. Generally I don't care for fiction books so why would I start now? As it turned out I did read "Twilight" briefly on the flight. Once I got home it just sat on my bed stand. I wasn't interested. Fortunately for me (not so much for my family) I was having trouble falling asleep one night a few weeks ago and decided to pick it up again. Surely this will bore me enough to fall asleep! Well, it did not bore me...no, no quite the opposite! I began reading page after page, as fast as I could. This was getting good. And Edward the Vampire? Ahhhhh, what a dreamy kind of guy *sigh*. Within days I had devoured "Twilight" and was hungry for more (pardon the pun). I found Meyer's second book in the series "New Moon" at Wal-Mart...Hooray!!!!! Currently I'm savoring every page not wanting it to end yet anxious to begin "Eclipse". What will happen to Edward and Bella?? I'm so excited to find out! How about you? Are you or have you read the "Twilight" series? Would love to hear from you!! my Blog colors again. Yeah, I get bored easily with the same old stuff...so hence the change. Speaking of change we are in need of a NEW Design Team over at Scrapwords. I'm looking for super talented writers and designers. Check back here or on Scrapwords for all the details later this week! I'm in Week 11 of my Challenge. I had a terrible Week 10. The way I look at it I'm starting a new week so there is no looking back. I began morning with my usual Balance Bar. These things ROCK! Seriously the caramel nut ones taste like a Snickers bar. Yum-o. The best part though is NO High Fructose Corn Syrup. My blood sugar stays stable and I'm able to workout hard without getting all shaky. Went outside for my walk...what PERFECT weather. Bright blue skies, a slight breeze and in the upper 60's. Fabulous! Now I'm sipping on a Pina Colada Protein shake with a dollop of fat free cool whip. These are my favorite! I promise to keep you posted on how I do this week. Guess where I'm going on Friday?! ????????????? I cannot wait to go!!!!!!!!!!!!!!!!!!!!!!!!!!!!!!!!!! Please be sure to check out Scrapwords this week. We'll have a new word of the week to focus on, a few new challenges and as always you'll find a friendly community!! I am so not happy with the way the past two weeks have gone. I am falling into my old habits and I can feel it. The self-loathing (that is a bit too harsh of a statement but right now that is how I feel), the not caring what I put in my mouth...the bloated waist...ACK!!!! 3 weeks back a dear family friend passed away. We went back to my hometown for the funeral and I ate my way through Fort Madison...fried taco's and all! :( I came home with every intent of starting back on the right foot. That lasted for one day (usually one meal) then I'd snitch a handful of Doritos (DARN chips!) here and a cookie or 2 there. All the while hating myself and thinking about the Challenge. "You are NOT finished when you lose. You are finished when you QUIT"
This is not an entry to tell you I'm giving in to food, to my weakness's, that I'm gonna quit. Oh no. This is just the truth. I'm struggling right now...but "this too shall pass". I'm gonna win...it's just gonna take some time. and sweet as I have so much to do today. First I AM BACK ON THE INTERNET!! I can't even begin to tell you how much I missed the internet!! My writing, my website, my friends...so glad to be back! BFL is not going so good with the eating. I have been so stressed the past two weeks. Still working out...but the food. I am recommitting to finishing the next weeks strong...I so want to do this. Already know I'm starting a new challenge the second week of September. This is short but I've got lots to do!!! Guess what? STILL NO INTERNET!!!!!! I'm at the Library. Thank goodness for that. If you've been to my website Scrapwords lately you know not a lot is going on...so sorry for that. Without internet running my business properly has been nearly impossible. Please know we have lots of new CHA products coming in weekly...I will have those on the site once I get my internet back. They tell me this week...it's such a long story as to why we don't have it. Let' just say I'm frustrated!! Okay, it's WEEK 9 on my Body For Life Challenge. Can you believe??!! I can't! I am recommitting to finishing strong in these next 3 weeks. My goal is to lose 5 more pounds and keep up workouts and making them more intense!! My good friend Kristin reminded me I must keep going!! Thanks! I have so much more I'd love to write, photos I'd live to post, etc...that will have to wait for the computer to come back on at my house. It's just weird writing at the library!! :) Have a happy Monday! We have been enjoying cooler weather here. Makes me think of Fall and football and soccer and long sleeve tee's and soup and all those yummy Fall things we love to do!! This is my favorite time of the year without a doubt!! My BFL Challenge is going okay. I'm exercising but the eating...can I just tell you I'm not loving vegtables at the moment? I mean I just don't want them...they don't even sound good. So while I'm not eating chips, etc. I'm not eating veggies. I'm also eating rather sporadically...meaning I'll eat my Balance bar for breakfast and some fruit after my workout...then lunch. Okay, but by late afternoon I'm just snacking. And for dinner I'm just snacking. Granted I'm snacking on good things, protein and healthy carbs...but not like the plan says. Needless to say I'm not dropping pounds and my body is just staying the same. I'm frustrated. Oh, how I'd hoped to be farther along than I am. The good thing is I'm getting stronger. Enough for now. The Library police are about to come over and kick me off!! Hey, everyone...I have been without internet at my house for 6 days!!!!!!!!!!! Those goofs turned off my internet when they were upgrading my husband's business...ugh! It should be back on tonight. So today I'm using my Mom's computer...not the same but I can use it. This is Week 8 on the BFL Challenge. Still struggling with not eating on plan. Was doing great then we left for the funeral and I used that as an excuse to eat. Life is always going to just happen...I've got to know that, plan for that and not use that as an excuse!!! I did take my supper Friday night to this festival I was at...I didn't eat the fair food at all. So that made me feel in control and pretty good about myself!!! It feels like Fall today. I am so loving that. Enjoyed a cup of Perro with my DH outside after my workout. Still on track for not missing one workout during this Challenge. Happy Tuesday. Life has been pretty hectic lately. Very stressful, I've felt out of sorts. This time of year is my least favorite...not because I don't like August but because of the type of business we're in everything just gets tight...our business dwindles down to almost nothing...so it tends to put us all in bad moods. :( Thankfully the college students will be back in three weeks and we will be able to breathe once again. It's Week 7 in my Body for Life Challenge. I don't know that I'm losing anything right now but I'll tell you I'm determined not to go off this plan!! In many ways I'm kicking myself for not being as diligent as I should have been about my food but on the other hand when I look at how far I've come emotionally I really have improved my life. My pants still fit the same as they did in Week 4...which is better than Week 1 but not where I'd hoped to be by Week 7. The main thing is this...with all this stress that is swirling around me I'm not giving up this Challenge!! In the past when I've tried this plan, life would get in the way and I'd just say FORGET IT!! This time I've come too far to throw in the towel. I haven't missed one workout yet. So proud of that. I'm eating great this week!! Do not eat off plan for the next 5 weeks is my goal. I can do that! So check out my new hairstyle. What do you think? I'm learning to love it. It's shorter than I wanted but it is fun and easy to wear. So I think the change is good!! I wear it all poofy and cute...so I'm using more styling products...Aussie will love that. We're having a cool contest over at Scrapwords. You should check it out TODAY. "100 Adjectives that Describe You". Really makes you stop and think about what you think of yourself. I'm loving that! I am so thankful for my friends!! This morning I called my good friend Amber. She is getting ready to have her 6th child...wow!! Anyway, she really helped me this morning...I needed to be reminded that everything would be okay. For being so fabulous to me I offered to take 4 of her children along with me and Emma to the FREE movie this afternoon. I am looking forward to that. Friends are God's gift to us...for sure. My Mom and I had some super sad news thrown our way yesterday...our dear family friend passed away suddenly Monday night. Her name was Palmyra but everyone called her Pal. She was one of the sweetest, most giving people I've ever known. Mom, Em and I will be traveling to Fort Madison Wednesday for the funeral. Take time today to enjoy your family, your friends and all that you love. We never know when our life here on earth will be no more. 1) Week 6 was really bad. Too much FOOD. Enough said. One of my top 3 goals for the Challenge was to never miss a workout. I'm proud to say that in nearly 7 weeks I haven't missed one...Hooray for me! So for the next 5 weeks of the Challenge I will not eat off plan. I won't do it. No way. NO!!! I sat down tonight with my Eating for Life recipe book and created a week's worth of menus. I'll share them here with you this week. I WILL not go off plan!!! This has just been a crappy week. I can't think of a week that has been this much of a downer. I woke up yesterday morning going...I just need to get away from the craziness. Decided to call my Mom (there she is my kitchen last Thanksgiving) and invite her to the movies with me and Emme!! Monday through Friday our local theater has FREE movies. Granted they are older ones but who cares... THEY ARE FREE!!! And right now the Ackmans can use a little free...so Mom drives over to pick me and Em up and we are off to the movies! Here is my sweet Emma. LOVE her soooo very much. What a joy she is in my life!! Heavenly Father blessed me dearly with her sweet spirit. What movie did we see? One of my personal favorite family movies. Movies have always made me feel better and going to the movies is the ultimate feel good adventure for me. Almost at the end of Week 6 for me and the BFL Challenge. Can't believe it. I've lost another pound as of this morning. Power walked/ran for 30 minutes. Pretty hot and steamy here. I made sure and did more hills than normal since I was short on time. Wanted to get a good workout in. In the morning I'll do arms and my goal is to get another 30-40 minutes of cardio in. I love the feeling after I've been outside, walking, running and sweating. My food is going so-so. Not on plan so much...but not overeating. Just eating healthy foods with sensible portions. And still able to put food out of my mind even though today sweets have been calling out to ME. We are looking for a Guest Designer on Scrapwords. Be sure and check out what we need on Pubcalls. You may be the next designer!! Have a healthy and happy weekend!! !